This entry was posted on November 10, 2014 by Jessica Anderson. 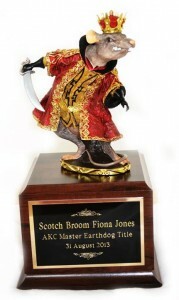 At Trophies2Go, we offer thousands of different trophies for any and all occasions. However sometimes you can't find exactly what you are looking for on our website. What do you do? We can help you create a unique, one-of-a-kind trophy just for your need. Read below to see examples of unique awards other customers have created. An engraved base is a great start to creating an unique award. We offer a few different options, including black, walnut or marble, in a variety of sizes. Engraving on the front is included in the price; add side plates for an additional fee to make it perpetual. If you are gluing something onto the top of a base, we have epoxy glue packets available for customers. Just give us a call to include one with your order. Read below to see what other customers have created using an engraved base. 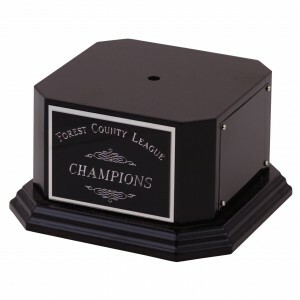 Bases are a great way to create a one-of-a-kind trophy. Just glue or attach any top. Option #1: Any figure top or resin award we carry can be attached to a base. 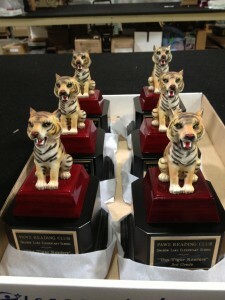 For example, one school created reading awards by attaching a tiger resin trophy, the school mascot, to an engraved base. These turned out so cute, and I'm sure the winners loved them! Tiger reading awards - a resin top attached to a black base. Option #2: Add your own top to a base to create a completely unique award. This customer has a dog club and wanted an award for her rat hunting event. We engraved this walnut base and she added the rat top, creating a completely custom and unique award for her club. I guarantee you won't see this award anywhere! We created the base and our customer attached the rat on the top. Our unique acrylic logo awards are the perfect solution for corporate and business recognition. The process involves sending us your logo, your design ideas, and then letting our designers create the perfect award for you! Check out these stylish awards we recently created for Microsoft. This Microsoft team wanted an award with a magnet. 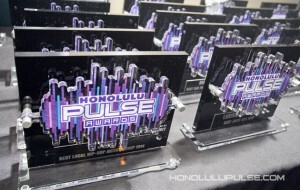 Here is another recent event we provided the awards for; the Best of Honolulu 'Pulse Awards"
Even though Trophies2Go sells the majority of it's awards via the Internet, we still want to provide you with the experience you'd expect at your local trophy store. No matter your event, we can help you create the perfect unique trophy with the 'wow' factor you are looking for. Questions? Our customer service team is here to help!Trophies2Go offers the flexibility of ordering online from your home, office, tablet or phone with the customer service of a local, family-owned business. Let us know how we can help think out of the box to create unique awards specific to your organization.